Cycling along the other day, I caught this delightful little pic (yeah, I know it’s little). It’s of a young girl, maybe 6 or 7 years of age who was just skipping, running and generally being active with the seagulls on a hill. Her parents/guardians were on top of the hill, however they’re out of this frame. It was a beautiful day and I thought to myself: that little girl feels good. She’s in the city and she’s feeling good. She obviously feels safe, and from what I can tell she is doing something that is fun whist being active. For her, this city is working. 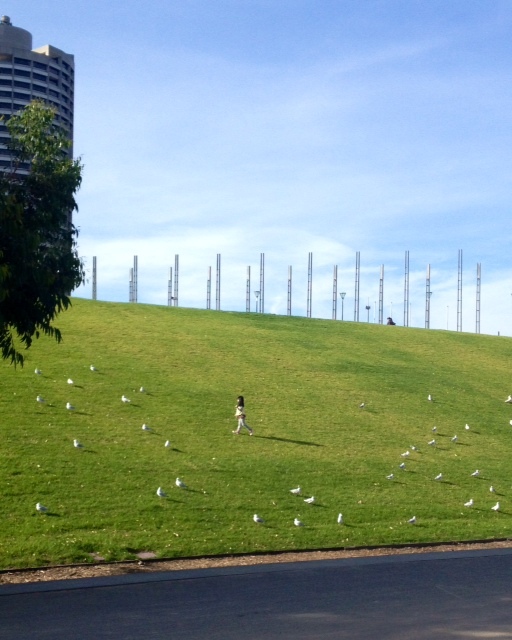 Imagine if that’s what we did: designed cities for seven year olds and seagulls. 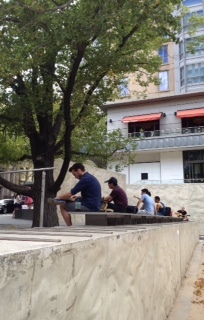 That truly is a bloke just reading a book at one end of a long wall and a bloke at the other end strumming a guitar and then a random few people chatting, staying and just ‘being’ in between these two urbanites. Nice. 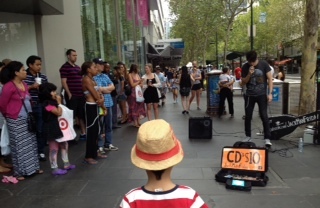 Meanwhile, further up the same street, a seriously good busker, Jack Man Friday draws a not insignificant crowd as he entertains young and old alike (and yes, you do need a permit to busk in Melbourne and have an audition – basically if a busker is legally busking in Melbourne, the quality is beyond question). 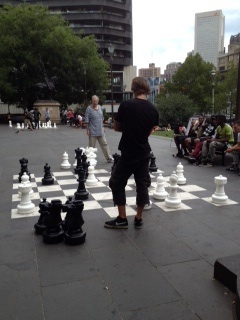 And then, further still – a couple of folks play chess as onlookers, well, look on. It may be presumptuous of me to say, but I suspect that these two may never have met were it not for the novelty sized chess game. Connections are made, albeit fleetingly, but that is the role of a city that works well and space that is utilised affectively. It allows for these connections. It facilitates them. It invites them and welcomes them when they arrive. 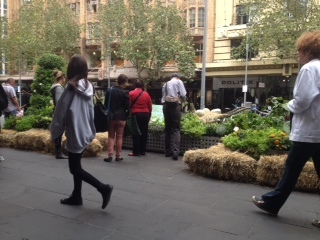 People stop and stay to smell and touch as they discover this pop up herb garden outside of the Town Hall (this was actually seen two weeks ago, but it just proves my point that this happens in Melbourne often). 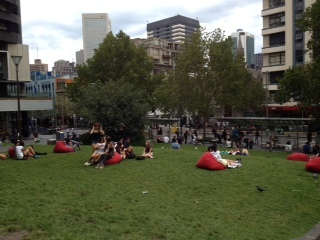 And lastly, people lounge outside of the State Library on beanbags provided by the Library (as is the chess). It could be argued that there is nothing really to ‘do’ here, but that is the point. People stay, because people are there. People go where people go because, well, we like people. We like being with them. We don’t want to talk to them (necessarily), but we like being near them and knowing they are there. People are interesting. People watching is legitimate. I look at how I use the city on a day like this one and know that I will be taking the long route to wherever I need to go just to be in the city for longer. This is a city that invites me to stay, and I welcome the invitation every time. Space is a word that is flung around in planning and architecture with wild abandon and when used in some disciplines, it can take on a variety of meanings in different contexts. Having worked in mental health, the term ‘safe space’ was used to provide clients with the knowledge that they were in a physical area where they would not be harmed. We each have our understanding of what our personal space is, and genuinely feel affronted if someone does not respect this. Indeed, we speak of our personal space being ‘violated’. Most interestingly, the required distance someone should keep from us is not spoken and agreed upon every time we meet someone for the first time. Rather, it is bound by cultural norms and expectations. When it comes to public space, all of these elements come into play in a fascinating and very subtle manner. As has been noted by individuals more experienced than I, public space is truly democratic space. It matters not your age, gender, income, political or sexual persuasion. Public space is a leveller. If we all share it, and we all use it, why is it that we can’t all have a similarly weighted opinion of it? A recent competition on Flinders Street train station here in Melbourne perhaps best exemplified this point. Of the shortlisted entrants, the public were invited to vote for the one they felt best deserving of the coverted prize. There were to be two prizes – the ‘People’s Choice’ and the one they would actually build (in short then, this could be reduced to ‘The One the People Didn’t Choose and Therefore Don’t Want’). The one the people chose was – I think – beautiful. Housed beneath a rooftop garden that comprised lawn, trees and nature, the original building of the station was complemented by it’s new surroundings. It was a design that invited people to sit, stroll and wander. It invited them to stay. Needless to say, it didn’t win the prize for the design that would actually be built. The winning prize was a stark, vaccuous, white, garish thing that didn’t blend with the environment and offered nothing soft. It certainly didn’t invite staying. And yet, and yet…this is the station to be built – this, ‘The One the People Didn’t Choose and Therefore Don’t Want’. I suspect that what happened was 6 or 7 middle aged men sat in a room and decided that from an architectural point of view this was the best. Well, most people aren’t architects. In fact, according to the CEO of CoDESIGN Studio, only 1.4% of the population are Designers, Planners or Architects. Does this then mean that only 1.4% of the population is somehow ‘allowed’ to comment on public space? if the People’s Choice is never to actually be chosen, then why give the people options in the first place?